Have you tried our Divine Woman Miracle Oil Serum? This beautiful serum truly is a Miracle for your skin, packed full of anti-ageing ingredients, so why should you be using it as part of your skin care routine? A serum might not be a part of your daily skin care routine, in fact a lot of people don’t know when to use serum or why it is so important. A face serum is specifically designed to give your skin a high dose of nutrients, helping target specific skin concerns, like ageing! 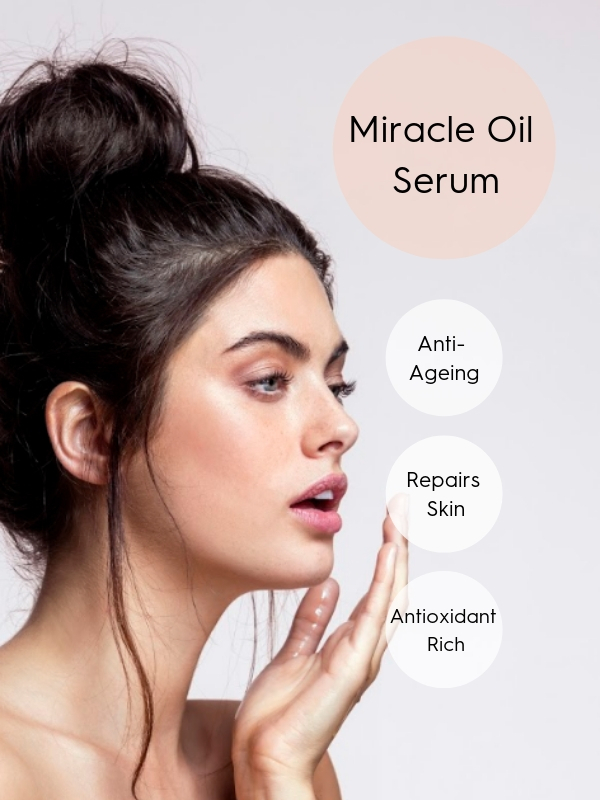 For example the Miracle Oil Serum will give your skin a potent dose of anti-ageing vitamin E, omega 3 fatty acids and mineral rich ingredients, the Miracle Oil Serum helps to accelerate skin repair and prevent premature ageing. There is a lot of confusion about whether a serum will hydrate your skin, particularly when it is an oil serum, like the Miracle Oil. A serum is designed to be used in conjunction with a moisturiser, although our Miracle Oil is rich and hydrating it actually helps lock moisture into your skin, featuring a combination of delicate essential oils to penetrate and nourish the skin while heavier molecular oils provide a barrier over the skin to lock in nutrients. So now that you know why you need to use a serum, how do you use it? A serum is usually applied after you cleanse and before you moisturise. For example if you use our Divine Woman collection you would cleanse with either our Lactic Cleanser or Cream Cleanser, tone with the Soothing Rose Toner, then apply serum followed by our Day Cream or Night Cream. You always need to apply a moisturiser over the top of a serum to make sure you are really locking in all those amazing nutrients and minerals! Essentially a serum is a treatment product, to help repair any skin concerns and is one of the best ways to accelerate and elevate your skin care routine!